Day 2: I'm trying to get myself organised when it comes to blogging - so here's my second blog post of the week!!! 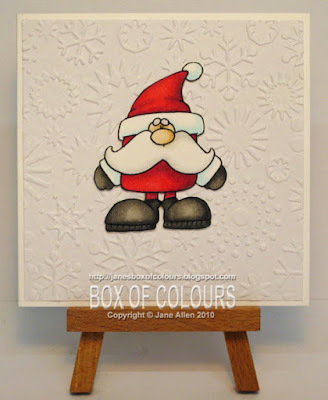 Todays card is pretty simple to make - an embossing folder (Cuttlebug me thinks) always makes a quick, yet effective background. Great for showcasing one of Dustin Pike's cool images - if you like this and other DP images I've used go check out his website - he's having an amazing Black Friday Sale! As always it's been coloured using Copics, then cut out and attached with thin foam pads - 3D cards are great, but make sure you don't go too mad with the depth or the Post Office will want lots of pennies to post it!!!! OK peeps, that's it for now but keep your eyes peeled for another card shortly - thanks as always for popping by the box. Your cut outs are so perfect they looked stamped on!! I love your work, thanks for sharing! Ooh did someone say cake! !